Latest updates after the flight reportedly carrying 188 passengers and crew crashed after leaving Jakarta. Nugroho Budi Wiryanto, chief of the Indonesian National Search and Rescue Agency, says some 300 soldiers, police and local fishermen are involved in the search – but no bodies have been found yet. Only ID cards, personal belongings and aircraft debris have been recovered so far. 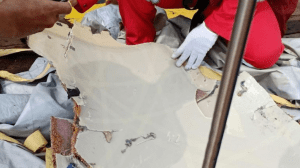 “The Indonesia Ministry of Transportation has confirmed it has located the wreckage of Lion Air Flight JT 610, a 737 MAX 8 en route from Jakarta to Pangkal Pinang,” the manufacturer said. “The Boeing Company is deeply saddened by the loss of Flight JT 610. We express our concern for those on board, and extend heartfelt sympathies to their families and loved ones. It shows a rapid increase in speed and a decrease in altitude in the last transmission from the plane – shown by the plummeting green line on the graph. The plane only reached an altitude of 1,580m (5,200ft) in its 13 minutes of flight. Scenes of distress and panic as relatives try desperately to find information about their loved ones. One women, Feni, said her soon-to-be-married sister was on the flight, along with her fiance, in-law and friend. “We don’t have any information,” she said. Indonesia’s finance minister, Sri Mulyani is meeting with the search and rescue agency chief to seek information about 20 staff who were reportedly on the plane. 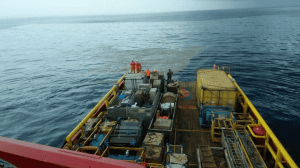 The early-morning flight was travelling from the capital Jakarta to tin-mining hub Pangkal Pinang. This was tweeted by the Sutopo Purwo Nugroho, the disaster agency spokesperson. The chief of the national search and rescue agency, Muhammad Syaugi, said the flight ended in deep waters. The agency has also requested the air force’s assistance. “The control allowed that, but then it lost contact,” he said. Founded on 1999, it now operates 183 routes, running 600 flights a day within Indonesia and surrounding countries including Malaysia, Saudi Arabia and China. It has been affected by accidents before. In 2013 one of its Boeing 737-800 jets missed the runway as it landed near the island resort of Bali. No-one on board was hurt. Last year two of its planes collided with a Wings air plane at a Sumatra airport, and in May 2016 two planes collided in Jakarta. In 2004 25 passengers of the airline died with the plane they were on crashed in heavy rain. Between 2007 and 2016 the European Union banned the airline from flying to EU member locations. 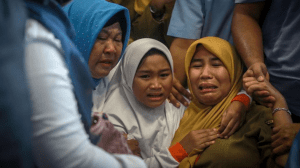 The aircraft had only been operated by the Lion Air group since August, they said in a statement. They said the pilot and co-pilot on the flight had together amassed 11,000 hours of flying time. 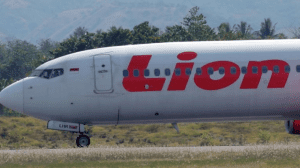 The plane, a Boeing 737 max 8 model, had been delivered to Lion Air in August. The plane is a fuel-efficient model of Boeing’s standard single-aisle aircraft. Lion Air subsidiary Malindo Air received the first delivery of the model in 2017. 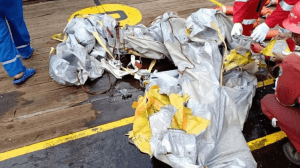 Head of search and rescue Muhmmad Syaugi said no distress signal had been received from the plane; Australia has also said it did not receive signal from the plane’s emergency locator. “We don’t know yet whether there are any survivors,” Mr Syaugi said. It is likely that officials will seek to recover the plane’s black box, where a cockpit voice recorder and data flight recorder are located. They will also examine data from the control tower. 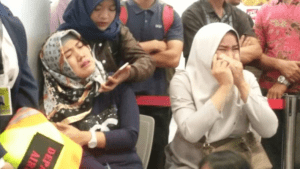 Family members of people on the plane have gathered at Depati Amir airport in Pangkal Pinang. A disaster agency spokesperson said the flight was carrying 181 passengers, including one child and two babies. Seven crew members were also on board. The flight was travelling from Indonesia’s capital Jakarta to the tin mining hub of Pangkal Pinang, on the island of Bangka. It left at 6.20 and was expected to reach its destination, to the North of Jakarta, about an hour later. Search and rescue agency have said the flight ended in waters 98 to 115ft (30-35m) deep. Slicks of oil are visible around the area where it lost contact. The include a crushed smartphone, books, bags, and parts of the aircraft. Flight Radar said it was processing detailed information transmitted by the aircraft and that “preliminary data show an increase in speed and decrease in altitude at last transmission”. Images from the site show the route of the plane continuing until just off the Jakarta coastline, then disappearing 13 minutes after takeoff. Indonesian authorities have confirmed that 188 people were on board the plane, which is believed to have crashed into the sea. “The aircraft was carrying 178 adult passengers, one child and two babies, with two pilots and five flight attendants,” said Sindu Rahayu, directorate general of Civil Aviation at the transport ministry.